I never know what to make with the jalapenos I grow…why do I even grow them? I guess because they’re easy and I always think I’ll make jalapeno poppers, but I never have enough peppers. BUT this recipe gives me the same flavors of poppers but much with only 2 peppers! This is another recipe I found through Pinterest, see I told you I’m becoming addicted! I made these for a family dinner on Sunday and they were gone in no time. I guess I should have doubled or tripled the batch, which I’ll be doing next time I make them! Cut bacon into small pieces and fry up. Drain on a paper towel to remove excess grease. Preheat oven to 350 degrees. Remove the seeds from the peppers and chop into small pieces. Roll out the crescent rolls and cut each triangle in half, making 16 pieces. 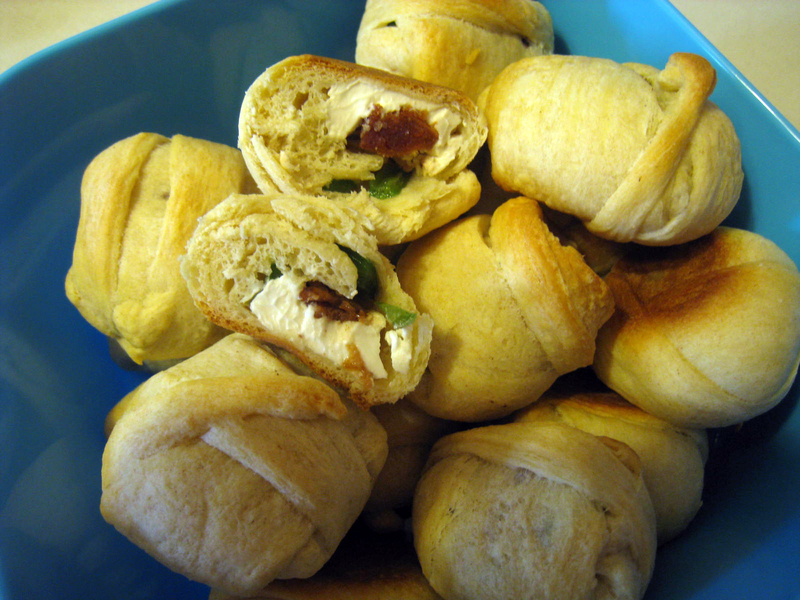 In each piece of dough, add a cube of cream cheese, a couple pieces of bacon and peppers. Bring the corners rogether and twist at top. Press the edges together to seal the seams and keep the filling inside. Bake for 10 – 12 minutes or until golden brown. These would also be great with some shredded cheddar cheese instead of the cream cheese.